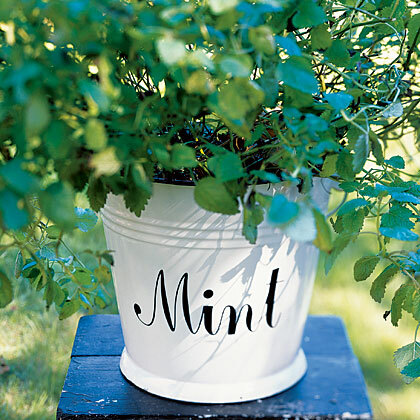 Fresh mint enhances food with a burst of cool flavor and an added dose of vitamins, calcium, and antioxidants. Although the two most common varieties of this refreshing, digestion-enhancing herb, peppermint and spearmint, are often used interchangeably, peppermint is a bit more pungent, while spearmint has a slightly smoother taste. Choose fresh-looking bunches with evenly colored leaves that show no sign of wilting. Store a bunch of mint in the fridge in a glass with water over the roots and a plastic bag loosely covering the leaves; it’ll keep for about a week this way. Tip: Change the water every day or two for better results. This summertime salad uses fresh mint in place of basil and sliced peaches instead of tomatoes for a sweet twist on the traditional Caprese salad. The combination of fresh peas with mint yield a harmonious and nutrition side dish. Peas are in the legume family, and these vegetables are typically high in protein and fiber, yet low in fat and cholesterol. Because they're higher in protein than many other types of vegetables, they're a good source of protein in vegetarian diets. Mint serves a dual role by flavoring the simple syrup and adorning the fresh fruit. The combination of fruit and mint gives this seasonal favorite an extra boost of disease-fighting antioxidants. Treat yourself to this decadent chocolate dessert next time you feel a headache coming on. Research has found that mint plays a role in relieving the pain of headaches as well as reducing the amount of time they may last. Make a large pitcher of green tea steeped with mint and sip on it through the day. Recent studies have found that including mint in your diet on a regular basis can help protect the body from certain types of infections because it slows down the growth of bacteria and fungus. Steeping the milk with fresh mint adds flavor and nutrients while pumping up the calcium content in the recipe. Get bonus nutrition points because this recipe is packed with heart-healthy ingredients. Tuna is loaded with omega-3 fats to help prevent heart attacks and stroke, while mint has also been found to promote heart health. The recipe also features high-fiber barley, lycopene-rich tomatoes, and cholesterol-lowering olive oil. A little bit of butter goes long way in flavoring grilled corn when it's combined with fresh mint, cilantro, and lemon juice.